Perfect for the younger age group, Kindycube is designed to resist the rough and tumble of pre-school children. Well-thought-out dimensions allow for a child’s privacy under adult supervision, with self-closing doors that shut without locking. Minimal dirt traps ensure these cubicles are easy to clean units. Kindycube is made from 13mm panels of our rugged, solid core Compact Laminate. All doors and partitions are finished with a smooth half-round edge. 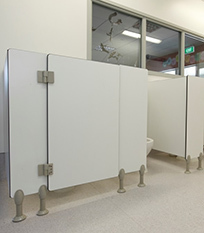 There are height adjustable nylon pedestals and nylon hinges for self-closing doors. Matching fixing brackets and toilet roll holders are available. 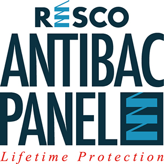 All Resco Compact Laminate products are extremely low maintenance, water, impact and graffiti resistant, and contain Antibac, an innovative new bacteria-repelling compound. Our panels come in New Zealand’s largest choice of colours and are backed by lengthy guarantees.